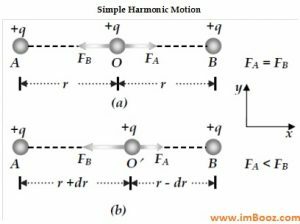 What is Simple Harmonic Motion? 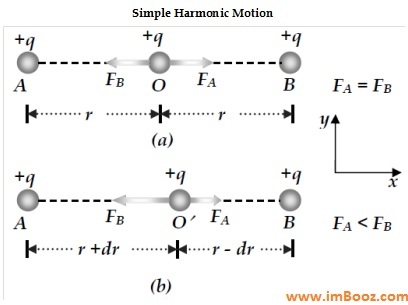 Simple harmonic motion (SHM) is an oscillatory motion of a particle about an equilibrium position under a restoring force that is proportional to the displacement from equilibrium position and in the opposite direction of the displacement. The maximum displacement of the particle from the equilibrium position is called amplitude A. The time required to complete one cycle is called time period T and the number of cycles per unit time is called frequency. Let us consider a charged particle having charge +q is present exactly in the middle of two other identical charged particles present at points A and B respectively as shown in Fig (a). It is clear that the net force on the charge in the middle will be zero. Now if the middle particle is displaced from its position by a distance dr towards either side of the middle point O (say along +ve x-direction) as shown in Fig (b). Then the force exert by the charge at point B on it will be greater that the force exert by the charge at point A. Thus, the middle particle experiences a net force that will be along -ve x-direction (i.e. opposite to its displacement) and hence it will exhibit SHM.